One of the common bothers during the chilly winter season is the prospect of sudden central heating breakdown at a time when there is no one around to help you out. The thought of being left in the cold, no hot water in your home and the safety risks can be mind-torturing for any home owner. Is there a way to avoid this? You can effectively avoid these frustrating situations and gas safety suspense for just a few coins. Eco Efficient Plymouth offers boiler servicing services that cover the whole of Plymouth, Saltash, Launceston, Exeter, Torquay and Tavistock areas. We are ready and able to help you prepare adequately for the winter by having complete boiler inspections and instant fixes to guarantee high and consistent performance through the unbearable cold. Swift troubleshooting and guaranteed solutions. This winter, ensure that your boiler is free from errors and possible sudden breakdown by having our experts inspect and fix any defects in advance. With Eco EfficientPlymouth boiler servicing, there will be no more complaining of high unreasonable energy bills. We offer cost-effective and energy-efficient boiler checks and repairs to all Plymouth property owners, tenants and realtors. In Plymouth it is a legal requirement to have your boiler inspected by professional and fully certified Gas Safe engineers to confirm Gas Safety, maximum functionality and fault identification. We offer reliable boiler servicing with regards to all gas safety regulations and issue gas safety landlord’s certificate. Apart from gas safety compliance, well timed boiler inspection will help you avoid boiler breakdowns and high energy bills over the winter season. You can schedule for pre-winter boiler servicing to ensure that every boiler component is functioning as it should and not prone to defects that would inconvenience you when you least expect it. 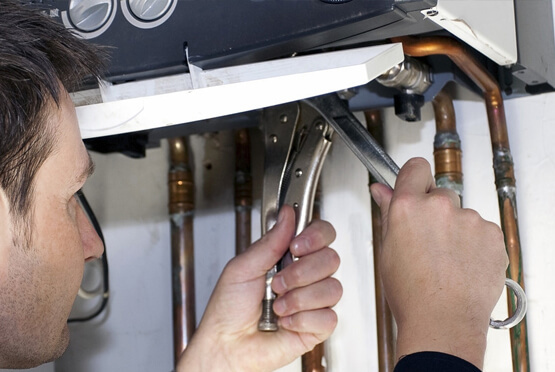 To avoid boiler uncertainties, our qualified engineers will check for any faults including minor errors, perform safety checks and assess your boiler energy efficiency. On completion, our polite boiler experts will discuss the inspection results and advice you on the way forward. We can recommend boiler repair, energy efficiency modifications or replacement depending on the nature of the problem identified.